Atul Gawande takes on the uncomfortable topics of old age and terminal illness, discussing ways in which medical approaches to these areas have resulted in less-than-optimal experiences for people facing them. In the case of care of the aged, nursing homes grew out of the basic hospital setting, and out of that has grown a culture of safety and institutional routine take precedence over quality of life and preferences of residents. With end-of-life, there is always something more that can be done--treatments, procedures--but the outcomes and trade-offs for the patients might be untenable. 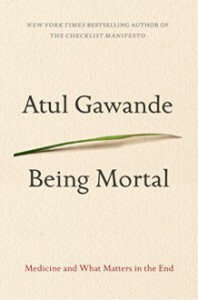 Gawande explores alternatives that take into account retaining quality of life and helping the elderly and dying identify what matters the most to them and to design the best approaches to their living situations and care. His examples include interactions with patients, friends, and his own father. In his process, he recounts learning better ways to communicate with patients, especially in the difficult conversations no one wants to have but that can make all the difference.